Gutter Cleaning in Carmichael – Call For Your Estimate Today! Are you looking for a qualified professional rain gutter cleaning Carmichael company that is able to clean and repair your clogged gutters at your home or business? Well, look no further. Monster's Gutters has been cleaning Carmichael rain gutters for residential and commercial clients for years. This makes us the number one choice in Carmichael for rain gutter cleaning. It matters not if your rain gutters are leaking or clogged, with our rain gutter knowledge and quality gutter cleaning Carmichael process, your rain gutter will be clean in no time! Monster's Gutters expert team of gutter cleaning Carmichael technicians are familiar with the damage that time debris and weather can cause to your gutter system. Should you not perform regular gutter cleaning Carmichael you find your self with much more costly problems like gutter repair or replacement. If you do not have gutter cleaning performed regularly it will result in clogging and overspill. This can slowly over time erode away at the foundation of your property as well as the walls the fascia and the rafter tails. If you own a home in Carmichael call for an estimate on a rain gutter cleaning today. Rain gutters can clog and fill with leaves, branches as well as other debris. Our team here at Monster's Gutters has made gutter cleaning easy and fast. Rain gutters are essential when it comes to channeling water away from the foundation of your property, which will prevent serious water damage to any of the walls and/or foundation of your property. So we insist that you call right away for a rain gutter cleaning Carmichael. Even if your gutter system is function properly, that doesn't mean that debris hasn't started to build up. Be preemptive in your fight against water erosion. It will help to make the aesthetics and foundation of your home last much longer just by performing this one task. Call for an estimate on a gutter cleaning on your Carmichael home or business. If you need a reliable company to handle your gutter cleaning Carmichael then call Monster's Gutter with any questions that you might have. You will find that our staff is friendly and helpful. We can restore your rain gutter system as well as perform routine maintenance and repairs. This will help to protect your property from the dangers of water erosion. When it comes to rain gutter cleaning Carmichael we find that business tends to pick up during the fall season. This happens due to the excess of leaves that almost all rooftops in Carmichael become littered with. These leaves than end up inevitably clogging your gutter system. This allows water to take the path of least resistance. Which can be anywhere. We have seen water pouring in through interior walls causing extensive damage. This is why we recommend that you have your rain gutters cleaned in Carmichael at least once every couple of years. Even the tiny pieces of gravel from your roof can cause your gutter system to clog over years. If you do not perform regular gutter cleaning Carmichael and maintenance then you will find that you will have much larger problems later on. If you do not perform this regular maintenance you will be putting your home at risk later on down the line. With our rain gutter cleaning Carmichael, you will be sure to prevent these potentially expensive damages from ever happening. Call today to schedule a rain gutter cleaning Carmichael and we will perform a routine maintenance to make sure that your gutter system is operating at its peak performance. Due to the weather in Carmichael we always have an extra crew standing by for emergency gutter cleaning Carmichael. We here at Monsters Gutters Cleaning Carmichael, take pride in the quality of work that we provide. Our gutter cleaning services take the worry and stress off your hands and will leave you with rain gutters that will last for years to come. Otherwise, when it rains water will flow over the sides of the gutter or through the bottom. Oftentimes, deteriorating the fascia boards & rafter tails. Many of our clients find themselves with a huge bill dealing with dry-rot. Our customers realize this danger and call Carmichael's best gutter cleaning service... Carmichael Monsters Gutter Cleaning (916) 333-0329 You Should call us today. When it comes to getting a gutter cleaned or all of your gutter cleaning Carmichael California residents find the most important aspect to be the service provider. Many gutter cleaners have left our clients downspouts clogged or not completely cleaned forcing them to find another service provider after the next rain. Gutter cleaning Carmichael has provided us a broad view of our competition which reminds us of the need to maintain our high standards. A home with a 1,600 square foot roof can shed about 1,000 gallons of water for every 1 inch of rain. A 21-foot gutter can weigh up to 300 pounds when completely full of water. Large rains and clogged gutters can be a big problem for any homeowner. This will cause your gutter to fail over time resulting in costly gutter repairs in Carmichael! Our Carmichael Gutter Cleaning is number one call today for a quote to be emailed right away. Rain Gutter Cleaning Carmichael is all exterior work. So there is no need for us to come to your home. This means that we can perform the rain gutter cleaning Carmichael at any time. Rain Gutters are an important part of your business or home and your main line of defense against water intrusion. They help to keep your biggest investment safe from flooding, they keep stagnant water from building up around your foundation. Avoid these costly water damages by having a routine rain gutter cleaning for your house in Carmichael. We provide a complete gutter cleaning service from the gutters to the downspouts including hauling away debris in Carmichael, California. Clean rain gutters are an essential part of making sure your gutters are functioning properly and doing their job the way they're supposed to. Gutter Cleaning in Auburn – Call For Your Estimate Today! Are you looking for a qualified professional rain gutter cleaning Auburn company that is able to clean and repair your clogged gutters at your home or business? Well, look no further. Monster's Gutters has been cleaning Auburn rain gutters for residential and commercial clients for years. This makes us the number one choice in Auburn for rain gutter cleaning. It matters not if your rain gutters are leaking or clogged, with our rain gutter knowledge and quality gutter cleaning Auburn process, your rain gutter will be clean in no time! Monster's Gutters expert team of gutter cleaning Auburn technicians are familiar with the damage that time debris and weather can cause to your gutter system. Should you not perform regular gutter cleaning Auburn you find your self with much more costly problems like gutter repair or replacement. If you do not have gutter cleaning performed regularly it will result in clogging and overspill. This can slowly over time erode away at the foundation of your property as well as the walls the fascia and the rafter tails. If you own a home in Auburn call for an estimate on a rain gutter cleaning today. Rain gutters can clog and fill with leaves, branches as well as other debris. Our team here at Monster's Gutters has made gutter cleaning easy and fast. Rain gutters are essential when it comes to channeling water away from the foundation of your property, which will prevent serious water damage to any of the walls and/or foundation of your property. So we insist that you call right away for a rain gutter cleaning Auburn. Even if your gutter system is function properly, that doesn't mean that debris hasn't started to build up. Be preemptive in your fight against water erosion. It will help to make the aesthetics and foundation of your home last much longer just by performing this one task. Call for an estimate on a gutter cleaning on your Auburn home or business. If you need a reliable company to handle your gutter cleaning Auburn then call Monster's Gutter with any questions that you might have. You will find that our staff is friendly and helpful. We can restore your rain gutter system as well as perform routine maintenance and repairs. This will help to protect your property from the dangers of water erosion. When it comes to rain gutter cleaning Auburn we find that business tends to pick up during the fall season. This happens due to the excess of leaves that almost all rooftops in Auburn become littered with. These leaves than end up inevitably clogging your gutter system. This allows water to take the path of least resistance. Which can be anywhere. We have seen water pouring in through interior walls causing extensive damage. This is why we recommend that you have your rain gutters cleaned in Auburn at least once every couple of years. Even the tiny pieces of gravel from your roof can cause your gutter system to clog over years. If you do not perform regular gutter cleaning Auburn and maintenance then you will find that you will have much larger problems later on. If you do not perform this regular maintenance you will be putting your home at risk later on down the line. With our rain gutter cleaning Auburn, you will be sure to prevent these potentially expensive damages from ever happening. Call today to schedule a rain gutter cleaning Auburn and we will perform a routine maintenance to make sure that your gutter system is operating at its peak performance. Due to the weather in Auburn we always have an extra crew standing by for emergency gutter cleaning Auburn. We here at Monsters Gutters Cleaning Auburn, take pride in the quality of work that we provide. Our gutter cleaning services take the worry and stress off your hands and will leave you with rain gutters that will last for years to come. Otherwise, when it rains water will flow over the sides of the gutter or through the bottom. Oftentimes, deteriorating the fascia boards & rafter tails. Many of our clients find themselves with a huge bill dealing with dry-rot. Our customers realize this danger and call Auburn's best gutter cleaning service... Auburn Monsters Gutter Cleaning (916) 333-0329 You Should call us today. When it comes to getting a gutter cleaned or all of your gutter cleaning Auburn California residents find the most important aspect to be the service provider. 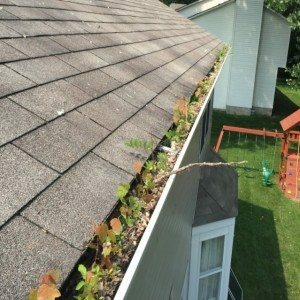 Many gutter cleaners have left our clients downspouts clogged or not completely cleaned forcing them to find another service provider after the next rain. Gutter cleaning Auburn has provided us a broad view of our competition which reminds us of the need to maintain our high standards. A home with a 1,600 square foot roof can shed about 1,000 gallons of water for every 1 inch of rain. A 21-foot gutter can weigh up to 300 pounds when completely full of water. Large rains and clogged gutters can be a big problem for any homeowner. This will cause your gutter to fail over time resulting in costly gutter repairs in Auburn! 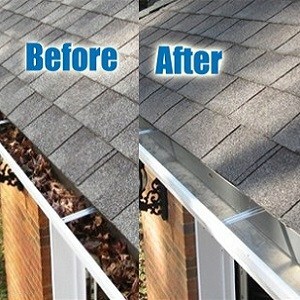 Our Auburn Gutter Cleaning is number one call today for a quote to be emailed right away. Rain Gutter Cleaning Auburn is all exterior work. So there is no need for us to come to your home. This means that we can perform the rain gutter cleaning Auburn at any time. Rain Gutters are an important part of your business or home and your main line of defense against water intrusion. They help to keep your biggest investment safe from flooding, they keep stagnant water from building up around your foundation. Avoid these costly water damages by having a routine rain gutter cleaning for your house in Auburn. We provide a complete gutter cleaning service from the gutters to the downspouts including hauling away debris in Auburn, California. Clean rain gutters are an essential part of making sure your gutters are functioning properly and doing their job the way they're supposed to. Gutter Cleaning in Loomis – Call For Your Estimate Today! Are you looking for a qualified professional rain gutter cleaning Loomis company that is able to clean and repair your clogged gutters at your home or business? Well, look no further. Monster's Gutters has been cleaning Loomis rain gutters for residential and commercial clients for years. This makes us the number one choice in Loomis for rain gutter cleaning. It matters not if your rain gutters are leaking or clogged, with our rain gutter knowledge and quality gutter cleaning Loomis process, your rain gutter will be clean in no time! Monster's Gutters expert team of gutter cleaning Loomis technicians are familiar with the damage that time debris and weather can cause to your gutter system. Should you not perform regular gutter cleaning Loomis you find your self with much more costly problems like gutter repair or replacement. If you do not have gutter cleaning performed regularly it will result in clogging and overspill. This can slowly over time erode away at the foundation of your property as well as the walls the fascia and the rafter tails. If you own a home in Loomis call for an estimate on a rain gutter cleaning today. Rain gutters can clog and fill with leaves, branches as well as other debris. Our team here at Monster's Gutters has made gutter cleaning easy and fast. Rain gutters are essential when it comes to channeling water away from the foundation of your property, which will prevent serious water damage to any of the walls and/or foundation of your property. So we insist that you call right away for a rain gutter cleaning Loomis. Even if your gutter system is function properly, that doesn't mean that debris hasn't started to build up. Be preemptive in your fight against water erosion. It will help to make the aesthetics and foundation of your home last much longer just by performing this one task. Call for an estimate on a gutter cleaning on your Loomis home or business. If you need a reliable company to handle your gutter cleaning Loomis then call Monster's Gutter with any questions that you might have. You will find that our staff is friendly and helpful. We can restore your rain gutter system as well as perform routine maintenance and repairs. This will help to protect your property from the dangers of water erosion. 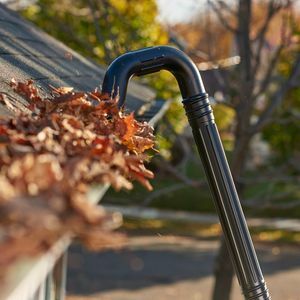 When it comes to rain gutter cleaning Loomis we find that business tends to pick up during the fall season. This happens due to the excess of leaves that almost all rooftops in Loomis become littered with. These leaves than end up inevitably clogging your gutter system. This allows water to take the path of least resistance. Which can be anywhere. We have seen water pouring in through interior walls causing extensive damage. This is why we recommend that you have your rain gutters cleaned in Loomis at least once every couple of years. Even the tiny pieces of gravel from your roof can cause your gutter system to clog over years. If you do not perform regular gutter cleaning Loomis and maintenance then you will find that you will have much larger problems later on. If you do not perform this regular maintenance you will be putting your home at risk later on down the line. With our rain gutter cleaning Loomis, you will be sure to prevent these potentially expensive damages from ever happening. Call today to schedule a rain gutter cleaning Loomis and we will perform a routine maintenance to make sure that your gutter system is operating at its peak performance. Due to the weather in Loomis we always have an extra crew standing by for emergency gutter cleaning Loomis. We here at Monsters Gutters Cleaning Loomis, take pride in the quality of work that we provide. Our gutter cleaning services take the worry and stress off your hands and will leave you with rain gutters that will last for years to come. Otherwise, when it rains water will flow over the sides of the gutter or through the bottom. Oftentimes, deteriorating the fascia boards & rafter tails. Many of our clients find themselves with a huge bill dealing with dry-rot. Our customers realize this danger and call Loomis's best gutter cleaning service... Loomis Monsters Gutter Cleaning (916) 333-0329 You Should call us today. When it comes to getting a gutter cleaned or all of your gutter cleaning Loomis California residents find the most important aspect to be the service provider. Many gutter cleaners have left our clients downspouts clogged or not completely cleaned forcing them to find another service provider after the next rain. Gutter cleaning Loomis has provided us a broad view of our competition which reminds us of the need to maintain our high standards. A home with a 1,600 square foot roof can shed about 1,000 gallons of water for every 1 inch of rain. A 21-foot gutter can weigh up to 300 pounds when completely full of water. Large rains and clogged gutters can be a big problem for any homeowner. This will cause your gutter to fail over time resulting in costly gutter repairs in Loomis! Our Loomis Gutter Cleaning is number one call today for a quote to be emailed right away. Rain Gutter Cleaning Loomis is all exterior work. So there is no need for us to come to your home. This means that we can perform the rain gutter cleaning Loomis at any time. Rain Gutters are an important part of your business or home and your main line of defense against water intrusion. They help to keep your biggest investment safe from flooding, they keep stagnant water from building up around your foundation. Avoid these costly water damages by having a routine rain gutter cleaning for your house in Loomis. We provide a complete gutter cleaning service from the gutters to the downspouts including hauling away debris in Loomis, California. Clean rain gutters are an essential part of making sure your gutters are functioning properly and doing their job the way they're supposed to. Gutter Cleaning in Rocklin – Call For Your Estimate Today! Are you looking for a qualified professional rain gutter cleaning Rocklin company that is able to clean and repair your clogged gutters at your home or business? Well, look no further. Monster's Gutters has been cleaning Rocklin rain gutters for residential and commercial clients for years. This makes us the number one choice in Rocklin for rain gutter cleaning. It matters not if your rain gutters are leaking or clogged, with our rain gutter knowledge and quality gutter cleaning Rocklin process, your rain gutter will be clean in no time! Monster's Gutters expert team of gutter cleaning Rocklin technicians are familiar with the damage that time debris and weather can cause to your gutter system. Should you not perform regular gutter cleaning Rocklin you find your self with much more costly problems like gutter repair or replacement. If you do not have gutter cleaning performed regularly it will result in clogging and overspill. This can slowly over time erode away at the foundation of your property as well as the walls the fascia and the rafter tails. If you own a home in Rocklin call for an estimate on a rain gutter cleaning today. Rain gutters can clog and fill with leaves, branches as well as other debris. Our team here at Monster's Gutters has made gutter cleaning easy and fast. Rain gutters are essential when it comes to channeling water away from the foundation of your property, which will prevent serious water damage to any of the walls and/or foundation of your property. So we insist that you call right away for a rain gutter cleaning Rocklin. Even if your gutter system is function properly, that doesn't mean that debris hasn't started to build up. Be preemptive in your fight against water erosion. It will help to make the aesthetics and foundation of your home last much longer just by performing this one task. Call for an estimate on a gutter cleaning on your Rocklin home or business. If you need a reliable company to handle your gutter cleaning Rocklin then call Monster's Gutter with any questions that you might have. You will find that our staff is friendly and helpful. We can restore your rain gutter system as well as perform routine maintenance and repairs. This will help to protect your property from the dangers of water erosion. When it comes to rain gutter cleaning Rocklin we find that business tends to pick up during the fall season. This happens due to the excess of leaves that almost all rooftops in Rocklin become littered with. These leaves than end up inevitably clogging your gutter system. This allows water to take the path of least resistance. Which can be anywhere. We have seen water pouring in through interior walls causing extensive damage. This is why we recommend that you have your rain gutters cleaned in Rocklin at least once every couple of years. Even the tiny pieces of gravel from your roof can cause your gutter system to clog over years. If you do not perform regular gutter cleaning Rocklin and maintenance then you will find that you will have much larger problems later on. If you do not perform this regular maintenance you will be putting your home at risk later on down the line. With our rain gutter cleaning Rocklin, you will be sure to prevent these potentially expensive damages from ever happening. Call today to schedule a rain gutter cleaning Rocklin and we will perform a routine maintenance to make sure that your gutter system is operating at its peak performance. Due to the weather in Rocklin we always have an extra crew standing by for emergency gutter cleaning Rocklin. We here at Monsters Gutters Cleaning Rocklin, take pride in the quality of work that we provide. Our gutter cleaning services take the worry and stress off your hands and will leave you with rain gutters that will last for years to come. Otherwise, when it rains water will flow over the sides of the gutter or through the bottom. Oftentimes, deteriorating the fascia boards & rafter tails. Many of our clients find themselves with a huge bill dealing with dry-rot. Our customers realize this danger and call Rocklin's best gutter cleaning service... Rocklin Monsters Gutter Cleaning (916) 333-0329 You Should call us today. When it comes to getting a gutter cleaned or all of your gutter cleaning Rocklin California residents find the most important aspect to be the service provider. Many gutter cleaners have left our clients downspouts clogged or not completely cleaned forcing them to find another service provider after the next rain. Gutter cleaning Rocklin has provided us a broad view of our competition which reminds us of the need to maintain our high standards. A home with a 1,600 square foot roof can shed about 1,000 gallons of water for every 1 inch of rain. A 21-foot gutter can weigh up to 300 pounds when completely full of water. Large rains and clogged gutters can be a big problem for any homeowner. This will cause your gutter to fail over time resulting in costly gutter repairs in Rocklin! Our Rocklin Gutter Cleaning is number one call today for a quote to be emailed right away. Rain Gutter Cleaning Rocklin is all exterior work. So there is no need for us to come to your home. This means that we can perform the rain gutter cleaning Rocklin at any time. Rain Gutters are an important part of your business or home and your main line of defense against water intrusion. They help to keep your biggest investment safe from flooding, they keep stagnant water from building up around your foundation. Avoid these costly water damages by having a routine rain gutter cleaning for your house in Rocklin. We provide a complete gutter cleaning service from the gutters to the downspouts including hauling away debris in Rocklin, California. Clean rain gutters are an essential part of making sure your gutters are functioning properly and doing their job the way they're supposed to. Gutter Cleaning in Arden Arcade – Call For Your Estimate Today! Are you looking for a qualified professional rain gutter cleaning Arden Arcade company that is able to clean and repair your clogged gutters at your home or business? Well, look no further. Monster's Gutters has been cleaning Arden Arcade rain gutters for residential and commercial clients for years. This makes us the number one choice in Arden Arcade for rain gutter cleaning. It matters not if your rain gutters are leaking or clogged, with our rain gutter knowledge and quality gutter cleaning Arden Arcade process, your rain gutter will be clean in no time! Monster's Gutters expert team of gutter cleaning Arden Arcade technicians are familiar with the damage that time debris and weather can cause to your gutter system. Should you not perform regular gutter cleaning Arden Arcade you find your self with much more costly problems like gutter repair or replacement. If you do not have gutter cleaning performed regularly it will result in clogging and overspill. This can slowly over time erode away at the foundation of your property as well as the walls the fascia and the rafter tails. If you own a home in Arden Arcade call for an estimate on a rain gutter cleaning today. Rain gutters can clog and fill with leaves, branches as well as other debris. Our team here at Monster's Gutters has made gutter cleaning easy and fast. Rain gutters are essential when it comes to channeling water away from the foundation of your property, which will prevent serious water damage to any of the walls and/or foundation of your property. So we insist that you call right away for a rain gutter cleaning Arden Arcade. Even if your gutter system is function properly, that doesn't mean that debris hasn't started to build up. Be preemptive in your fight against water erosion. It will help to make the aesthetics and foundation of your home last much longer just by performing this one task. Call for an estimate on a gutter cleaning on your Arden Arcade home or business. If you need a reliable company to handle your gutter cleaning Arden Arcade then call Monster's Gutter with any questions that you might have. You will find that our staff is friendly and helpful. We can restore your rain gutter system as well as perform routine maintenance and repairs. This will help to protect your property from the dangers of water erosion. When it comes to rain gutter cleaning Arden Arcade we find that business tends to pick up during the fall season. This happens due to the excess of leaves that almost all rooftops in Arden Arcade become littered with. These leaves than end up inevitably clogging your gutter system. This allows water to take the path of least resistance. Which can be anywhere. We have seen water pouring in through interior walls causing extensive damage. This is why we recommend that you have your rain gutters cleaned in Arden Arcade at least once every couple of years. Even the tiny pieces of gravel from your roof can cause your gutter system to clog over years. If you do not perform regular gutter cleaning Arden Arcade and maintenance then you will find that you will have much larger problems later on. If you do not perform this regular maintenance you will be putting your home at risk later on down the line. With our rain gutter cleaning Arden Arcade, you will be sure to prevent these potentially expensive damages from ever happening. Call today to schedule a rain gutter cleaning Arden Arcade and we will perform a routine maintenance to make sure that your gutter system is operating at its peak performance. Due to the weather in Arden Arcade we always have an extra crew standing by for emergency gutter cleaning Arden Arcade. We here at Monsters Gutters Cleaning Arden Arcade, take pride in the quality of work that we provide. Our gutter cleaning services take the worry and stress off your hands and will leave you with rain gutters that will last for years to come. Otherwise, when it rains water will flow over the sides of the gutter or through the bottom. Oftentimes, deteriorating the fascia boards & rafter tails. Many of our clients find themselves with a huge bill dealing with dry-rot. Our customers realize this danger and call Arden Arcade's best gutter cleaning service... Arden Arcade Monsters Gutter Cleaning (916) 333-0329 You Should call us today. When it comes to getting a gutter cleaned or all of your gutter cleaning Arden Arcade California residents find the most important aspect to be the service provider. Many gutter cleaners have left our clients downspouts clogged or not completely cleaned forcing them to find another service provider after the next rain. Gutter cleaning Arden Arcade has provided us a broad view of our competition which reminds us of the need to maintain our high standards. A home with a 1,600 square foot roof can shed about 1,000 gallons of water for every 1 inch of rain. A 21-foot gutter can weigh up to 300 pounds when completely full of water. Large rains and clogged gutters can be a big problem for any homeowner. This will cause your gutter to fail over time resulting in costly gutter repairs in Arden Arcade! Our Arden Arcade Gutter Cleaning is number one call today for a quote to be emailed right away. Rain Gutter Cleaning Arden Arcade is all exterior work. So there is no need for us to come to your home. This means that we can perform the rain gutter cleaning Arden Arcade at any time. Rain Gutters are an important part of your business or home and your main line of defense against water intrusion. They help to keep your biggest investment safe from flooding, they keep stagnant water from building up around your foundation. Avoid these costly water damages by having a routine rain gutter cleaning for your house in Arden Arcade. We provide a complete gutter cleaning service from the gutters to the downspouts including hauling away debris in Arden Arcade, California. Clean rain gutters are an essential part of making sure your gutters are functioning properly and doing their job the way they're supposed to. Gutter Cleaning in Lincoln – Call For Your Estimate Today! Are you looking for a qualified professional rain gutter cleaning Lincoln company that is able to clean and repair your clogged gutters at your home or business? Well, look no further. Monster's Gutters has been cleaning Lincoln rain gutters for residential and commercial clients for years. This makes us the number one choice in Lincoln for rain gutter cleaning. It matters not if your rain gutters are leaking or clogged, with our rain gutter knowledge and quality gutter cleaning Lincoln process, your rain gutter will be clean in no time! Monster's Gutters expert team of gutter cleaning Lincoln technicians are familiar with the damage that time debris and weather can cause to your gutter system. Should you not perform regular gutter cleaning Lincoln you find your self with much more costly problems like gutter repair or replacement. If you do not have gutter cleaning performed regularly it will result in clogging and overspill. This can slowly over time erode away at the foundation of your property as well as the walls the fascia and the rafter tails. If you own a home in Lincoln call for an estimate on a rain gutter cleaning today. Rain gutters can clog and fill with leaves, branches as well as other debris. Our team here at Monster's Gutters has made gutter cleaning easy and fast. Rain gutters are essential when it comes to channeling water away from the foundation of your property, which will prevent serious water damage to any of the walls and/or foundation of your property. So we insist that you call right away for a rain gutter cleaning Lincoln. Even if your gutter system is function properly, that doesn't mean that debris hasn't started to build up. Be preemptive in your fight against water erosion. It will help to make the aesthetics and foundation of your home last much longer just by performing this one task. Call for an estimate on a gutter cleaning on your Lincoln home or business. If you need a reliable company to handle your gutter cleaning Lincoln then call Monster's Gutter with any questions that you might have. You will find that our staff is friendly and helpful. We can restore your rain gutter system as well as perform routine maintenance and repairs. This will help to protect your property from the dangers of water erosion. When it comes to rain gutter cleaning Lincoln we find that business tends to pick up during the fall season. This happens due to the excess of leaves that almost all rooftops in Lincoln become littered with. These leaves than end up inevitably clogging your gutter system. This allows water to take the path of least resistance. Which can be anywhere. We have seen water pouring in through interior walls causing extensive damage. This is why we recommend that you have your rain gutters cleaned in Lincoln at least once every couple of years. Even the tiny pieces of gravel from your roof can cause your gutter system to clog over years. If you do not perform regular gutter cleaning Lincoln and maintenance then you will find that you will have much larger problems later on. If you do not perform this regular maintenance you will be putting your home at risk later on down the line. With our rain gutter cleaning Lincoln, you will be sure to prevent these potentially expensive damages from ever happening. Call today to schedule a rain gutter cleaning Lincoln and we will perform a routine maintenance to make sure that your gutter system is operating at its peak performance. Due to the weather in Lincoln we always have an extra crew standing by for emergency gutter cleaning Lincoln. We here at Monsters Gutters Cleaning Lincoln, take pride in the quality of work that we provide. Our gutter cleaning services take the worry and stress off your hands and will leave you with rain gutters that will last for years to come. Otherwise, when it rains water will flow over the sides of the gutter or through the bottom. Oftentimes, deteriorating the fascia boards & rafter tails. Many of our clients find themselves with a huge bill dealing with dry-rot. Our customers realize this danger and call Lincoln's best gutter cleaning service... Lincoln Monsters Gutter Cleaning (916) 333-0329 You Should call us today. When it comes to getting a gutter cleaned or all of your gutter cleaning Lincoln California residents find the most important aspect to be the service provider. Many gutter cleaners have left our clients downspouts clogged or not completely cleaned forcing them to find another service provider after the next rain. Gutter cleaning Lincoln has provided us a broad view of our competition which reminds us of the need to maintain our high standards. A home with a 1,600 square foot roof can shed about 1,000 gallons of water for every 1 inch of rain. A 21-foot gutter can weigh up to 300 pounds when completely full of water. Large rains and clogged gutters can be a big problem for any homeowner. This will cause your gutter to fail over time resulting in costly gutter repairs in Lincoln! Our Lincoln Gutter Cleaning is number one call today for a quote to be emailed right away. Rain Gutter Cleaning Lincoln is all exterior work. So there is no need for us to come to your home. This means that we can perform the rain gutter cleaning Lincoln at any time. Rain Gutters are an important part of your business or home and your main line of defense against water intrusion. They help to keep your biggest investment safe from flooding, they keep stagnant water from building up around your foundation. Avoid these costly water damages by having a routine rain gutter cleaning for your house in Lincoln. We provide a complete gutter cleaning service from the gutters to the downspouts including hauling away debris in Lincoln, California. Clean rain gutters are an essential part of making sure your gutters are functioning properly and doing their job the way they're supposed to. Gutter Cleaning in Folsom – Call For Your Estimate Today! Are you looking for a qualified professional rain gutter cleaning Folsom company that is able to clean and repair your clogged gutters at your home or business? Well, look no further. Monster's Gutters has been cleaning Folsom rain gutters for residential and commercial clients for years. This makes us the number one choice in Folsom for rain gutter cleaning. It matters not if your rain gutters are leaking or clogged, with our rain gutter knowledge and quality gutter cleaning Folsom process, your rain gutter will be clean in no time! Monster's Gutters expert team of gutter cleaning Folsom technicians are familiar with the damage that time debris and weather can cause to your gutter system. Should you not perform regular gutter cleaning Folsom you find your self with much more costly problems like gutter repair or replacement. If you do not have gutter cleaning performed regularly it will result in clogging and overspill. This can slowly over time erode away at the foundation of your property as well as the walls the fascia and the rafter tails. If you own a home in Folsom call for an estimate on a rain gutter cleaning today. Rain gutters can clog and fill with leaves, branches as well as other debris. Our team here at Monster's Gutters has made gutter cleaning easy and fast. Rain gutters are essential when it comes to channeling water away from the foundation of your property, which will prevent serious water damage to any of the walls and/or foundation of your property. So we insist that you call right away for a rain gutter cleaning Folsom. Even if your gutter system is function properly, that doesn't mean that debris hasn't started to build up. Be preemptive in your fight against water erosion. It will help to make the aesthetics and foundation of your home last much longer just by performing this one task. Call for an estimate on a gutter cleaning on your Folsom home or business. If you need a reliable company to handle your gutter cleaning Folsom then call Monster's Gutter with any questions that you might have. You will find that our staff is friendly and helpful. We can restore your rain gutter system as well as perform routine maintenance and repairs. This will help to protect your property from the dangers of water erosion. When it comes to rain gutter cleaning Folsom we find that business tends to pick up during the fall season. This happens due to the excess of leaves that almost all rooftops in Folsom become littered with. These leaves than end up inevitably clogging your gutter system. This allows water to take the path of least resistance. Which can be anywhere. We have seen water pouring in through interior walls causing extensive damage. This is why we recommend that you have your rain gutters cleaned in Folsom at least once every couple of years. Even the tiny pieces of gravel from your roof can cause your gutter system to clog over years. If you do not perform regular gutter cleaning Folsom and maintenance then you will find that you will have much larger problems later on. If you do not perform this regular maintenance you will be putting your home at risk later on down the line. With our rain gutter cleaning Folsom, you will be sure to prevent these potentially expensive damages from ever happening. Call today to schedule a rain gutter cleaning Folsom and we will perform a routine maintenance to make sure that your gutter system is operating at its peak performance. Due to the weather in Folsom we always have an extra crew standing by for emergency gutter cleaning Folsom. We here at Monsters Gutters Cleaning Folsom, take pride in the quality of work that we provide. Our gutter cleaning services take the worry and stress off your hands and will leave you with rain gutters that will last for years to come. Otherwise, when it rains water will flow over the sides of the gutter or through the bottom. Oftentimes, deteriorating the fascia boards & rafter tails. Many of our clients find themselves with a huge bill dealing with dry-rot. Our customers realize this danger and call Folsom's best gutter cleaning service... Folsom Monsters Gutter Cleaning (916) 333-0329 You Should call us today. When it comes to getting a gutter cleaned or all of your gutter cleaning Folsom California residents find the most important aspect to be the service provider. Many gutter cleaners have left our clients downspouts clogged or not completely cleaned forcing them to find another service provider after the next rain. Gutter cleaning Folsom has provided us a broad view of our competition which reminds us of the need to maintain our high standards. A home with a 1,600 square foot roof can shed about 1,000 gallons of water for every 1 inch of rain. A 21-foot gutter can weigh up to 300 pounds when completely full of water. Large rains and clogged gutters can be a big problem for any homeowner. This will cause your gutter to fail over time resulting in costly gutter repairs in Folsom! Our Folsom Gutter Cleaning is number one call today for a quote to be emailed right away. Rain Gutter Cleaning Folsom is all exterior work. So there is no need for us to come to your home. This means that we can perform the rain gutter cleaning Folsom at any time. Rain Gutters are an important part of your business or home and your main line of defense against water intrusion. They help to keep your biggest investment safe from flooding, they keep stagnant water from building up around your foundation. Avoid these costly water damages by having a routine rain gutter cleaning for your house in Folsom. We provide a complete gutter cleaning service from the gutters to the downspouts including hauling away debris in Folsom, California. Clean rain gutters are an essential part of making sure your gutters are functioning properly and doing their job the way they're supposed to. Gutter Cleaning in Elk Grove – Call For Your Estimate Today! Are you looking for a qualified professional rain gutter cleaning Elk Grove company that is able to clean and repair your clogged gutters at your home or business? Well, look no further. Monster's Gutters has been cleaning Elk Grove rain gutters for residential and commercial clients for years. This makes us the number one choice in Elk Grove for rain gutter cleaning. It matters not if your rain gutters are leaking or clogged, with our rain gutter knowledge and quality gutter cleaning Elk Grove process, your rain gutter will be clean in no time! Monster's Gutters expert team of gutter cleaning Elk Grove technicians are familiar with the damage that time debris and weather can cause to your gutter system. Should you not perform regular gutter cleaning Elk Grove you find your self with much more costly problems like gutter repair or replacement. If you do not have gutter cleaning performed regularly it will result in clogging and overspill. This can slowly over time erode away at the foundation of your property as well as the walls the fascia and the rafter tails. If you own a home in Elk Grove call for an estimate on a rain gutter cleaning today. Rain gutters can clog and fill with leaves, branches as well as other debris. Our team here at Monster's Gutters has made gutter cleaning easy and fast. Rain gutters are essential when it comes to channeling water away from the foundation of your property, which will prevent serious water damage to any of the walls and/or foundation of your property. So we insist that you call right away for a rain gutter cleaning Elk Grove. Even if your gutter system is function properly, that doesn't mean that debris hasn't started to build up. Be preemptive in your fight against water erosion. It will help to make the aesthetics and foundation of your home last much longer just by performing this one task. Call for an estimate on a gutter cleaning on your Elk Grove home or business. If you need a reliable company to handle your gutter cleaning Elk Grove then call Monster's Gutter with any questions that you might have. You will find that our staff is friendly and helpful. We can restore your rain gutter system as well as perform routine maintenance and repairs. This will help to protect your property from the dangers of water erosion. When it comes to rain gutter cleaning Elk Grove we find that business tends to pick up during the fall season. This happens due to the excess of leaves that almost all rooftops in Elk Grove become littered with. These leaves than end up inevitably clogging your gutter system. This allows water to take the path of least resistance. Which can be anywhere. We have seen water pouring in through interior walls causing extensive damage. This is why we recommend that you have your rain gutters cleaned in Elk Grove at least once every couple of years. Even the tiny pieces of gravel from your roof can cause your gutter system to clog over years. If you do not perform regular gutter cleaning Elk Grove and maintenance then you will find that you will have much larger problems later on. If you do not perform this regular maintenance you will be putting your home at risk later on down the line. With our rain gutter cleaning Elk Grove, you will be sure to prevent these potentially expensive damages from ever happening. Call today to schedule a rain gutter cleaning Elk Grove and we will perform a routine maintenance to make sure that your gutter system is operating at its peak performance. Due to the weather in Elk Grove we always have an extra crew standing by for emergency gutter cleaning Elk Grove. We here at Monsters Gutters Cleaning Elk Grove, take pride in the quality of work that we provide. Our gutter cleaning services take the worry and stress off your hands and will leave you with rain gutters that will last for years to come. Otherwise, when it rains water will flow over the sides of the gutter or through the bottom. Oftentimes, deteriorating the fascia boards & rafter tails. Many of our clients find themselves with a huge bill dealing with dry-rot. Our customers realize this danger and call Elk Grove's best gutter cleaning service... Elk Grove Monsters Gutter Cleaning (916) 333-0329 You Should call us today. When it comes to getting a gutter cleaned or all of your gutter cleaning Elk Grove California residents find the most important aspect to be the service provider. Many gutter cleaners have left our clients downspouts clogged or not completely cleaned forcing them to find another service provider after the next rain. Gutter cleaning Elk Grove has provided us a broad view of our competition which reminds us of the need to maintain our high standards. A home with a 1,600 square foot roof can shed about 1,000 gallons of water for every 1 inch of rain. A 21-foot gutter can weigh up to 300 pounds when completely full of water. Large rains and clogged gutters can be a big problem for any homeowner. This will cause your gutter to fail over time resulting in costly gutter repairs in Elk Grove! Our Elk Grove Gutter Cleaning is number one call today for a quote to be emailed right away. Rain Gutter Cleaning Elk Grove is all exterior work. So there is no need for us to come to your home. This means that we can perform the rain gutter cleaning Elk Grove at any time. Rain Gutters are an important part of your business or home and your main line of defense against water intrusion. They help to keep your biggest investment safe from flooding, they keep stagnant water from building up around your foundation. Avoid these costly water damages by having a routine rain gutter cleaning for your house in Elk Grove. We provide a complete gutter cleaning service from the gutters to the downspouts including hauling away debris in Elk Grove, California. Clean rain gutters are an essential part of making sure your gutters are functioning properly and doing their job the way they're supposed to. Gutter Cleaning in El Dorado Hills – Call For Your Estimate Today! Are you looking for a qualified professional rain gutter cleaning El Dorado Hills company that is able to clean and repair your clogged gutters at your home or business? Well, look no further. Monster's Gutters has been cleaning El Dorado Hills rain gutters for residential and commercial clients for years. This makes us the number one choice in El Dorado Hills for rain gutter cleaning. It matters not if your rain gutters are leaking or clogged, with our rain gutter knowledge and quality gutter cleaning El Dorado Hills process, your rain gutter will be clean in no time! Monster's Gutters expert team of gutter cleaning El Dorado Hills technicians are familiar with the damage that time debris and weather can cause to your gutter system. Should you not perform regular gutter cleaning El Dorado Hills you find your self with much more costly problems like gutter repair or replacement. If you do not have gutter cleaning performed regularly it will result in clogging and overspill. This can slowly over time erode away at the foundation of your property as well as the walls the fascia and the rafter tails. If you own a home in El Dorado Hills call for an estimate on a rain gutter cleaning today. Rain gutters can clog and fill with leaves, branches as well as other debris. Our team here at Monster's Gutters has made gutter cleaning easy and fast. Rain gutters are essential when it comes to channeling water away from the foundation of your property, which will prevent serious water damage to any of the walls and/or foundation of your property. So we insist that you call right away for a rain gutter cleaning El Dorado Hills. Even if your gutter system is function properly, that doesn't mean that debris hasn't started to build up. Be preemptive in your fight against water erosion. It will help to make the aesthetics and foundation of your home last much longer just by performing this one task. Call for an estimate on a gutter cleaning on your El Dorado Hills home or business. If you need a reliable company to handle your gutter cleaning El Dorado Hills then call Monster's Gutter with any questions that you might have. You will find that our staff is friendly and helpful. We can restore your rain gutter system as well as perform routine maintenance and repairs. This will help to protect your property from the dangers of water erosion. When it comes to rain gutter cleaning El Dorado Hills we find that business tends to pick up during the fall season. This happens due to the excess of leaves that almost all rooftops in El Dorado Hills become littered with. These leaves than end up inevitably clogging your gutter system. This allows water to take the path of least resistance. Which can be anywhere. We have seen water pouring in through interior walls causing extensive damage. This is why we recommend that you have your rain gutters cleaned in El Dorado Hills at least once every couple of years. Even the tiny pieces of gravel from your roof can cause your gutter system to clog over years. If you do not perform regular gutter cleaning El Dorado Hills and maintenance then you will find that you will have much larger problems later on. If you do not perform this regular maintenance you will be putting your home at risk later on down the line. With our rain gutter cleaning El Dorado Hills, you will be sure to prevent these potentially expensive damages from ever happening. Call today to schedule a rain gutter cleaning El Dorado Hills and we will perform a routine maintenance to make sure that your gutter system is operating at its peak performance. Due to the weather in El Dorado Hills we always have an extra crew standing by for emergency gutter cleaning El Dorado Hills. We here at Monsters Gutters Cleaning El Dorado Hills, take pride in the quality of work that we provide. Our gutter cleaning services take the worry and stress off your hands and will leave you with rain gutters that will last for years to come. Otherwise, when it rains water will flow over the sides of the gutter or through the bottom. Oftentimes, deteriorating the fascia boards & rafter tails. Many of our clients find themselves with a huge bill dealing with dry-rot. Our customers realize this danger and call El Dorado Hills's best gutter cleaning service... El Dorado Hills Monsters Gutter Cleaning (916) 333-0329 You Should call us today. When it comes to getting a gutter cleaned or all of your gutter cleaning El Dorado Hills California residents find the most important aspect to be the service provider. Many gutter cleaners have left our clients downspouts clogged or not completely cleaned forcing them to find another service provider after the next rain. Gutter cleaning El Dorado Hills has provided us a broad view of our competition which reminds us of the need to maintain our high standards. A home with a 1,600 square foot roof can shed about 1,000 gallons of water for every 1 inch of rain. A 21-foot gutter can weigh up to 300 pounds when completely full of water. Large rains and clogged gutters can be a big problem for any homeowner. This will cause your gutter to fail over time resulting in costly gutter repairs in El Dorado Hills! Our El Dorado Hills Gutter Cleaning is number one call today for a quote to be emailed right away. Rain Gutter Cleaning El Dorado Hills is all exterior work. So there is no need for us to come to your home. This means that we can perform the rain gutter cleaning El Dorado Hills at any time. Rain Gutters are an important part of your business or home and your main line of defense against water intrusion. They help to keep your biggest investment safe from flooding, they keep stagnant water from building up around your foundation. Avoid these costly water damages by having a routine rain gutter cleaning for your house in El Dorado Hills. We provide a complete gutter cleaning service from the gutters to the downspouts including hauling away debris in El Dorado Hills, California. Clean rain gutters are an essential part of making sure your gutters are functioning properly and doing their job the way they're supposed to. Gutter Cleaning in Rosemont – Call For Your Estimate Today! Are you looking for a qualified professional rain gutter cleaning Rosemont company that is able to clean and repair your clogged gutters at your home or business? Well, look no further. Monster's Gutters has been cleaning Rosemont rain gutters for residential and commercial clients for years. This makes us the number one choice in Rosemont for rain gutter cleaning. It matters not if your rain gutters are leaking or clogged, with our rain gutter knowledge and quality gutter cleaning Rosemont process, your rain gutter will be clean in no time! Monster's Gutters expert team of gutter cleaning Rosemont technicians are familiar with the damage that time debris and weather can cause to your gutter system. Should you not perform regular gutter cleaning Rosemont you find your self with much more costly problems like gutter repair or replacement. If you do not have gutter cleaning performed regularly it will result in clogging and overspill. This can slowly over time erode away at the foundation of your property as well as the walls the fascia and the rafter tails. If you own a home in Rosemont call for an estimate on a rain gutter cleaning today. Rain gutters can clog and fill with leaves, branches as well as other debris. Our team here at Monster's Gutters has made gutter cleaning easy and fast. Rain gutters are essential when it comes to channeling water away from the foundation of your property, which will prevent serious water damage to any of the walls and/or foundation of your property. So we insist that you call right away for a rain gutter cleaning Rosemont. Even if your gutter system is function properly, that doesn't mean that debris hasn't started to build up. Be preemptive in your fight against water erosion. It will help to make the aesthetics and foundation of your home last much longer just by performing this one task. Call for an estimate on a gutter cleaning on your Rosemont home or business. If you need a reliable company to handle your gutter cleaning Rosemont then call Monster's Gutter with any questions that you might have. You will find that our staff is friendly and helpful. We can restore your rain gutter system as well as perform routine maintenance and repairs. This will help to protect your property from the dangers of water erosion. When it comes to rain gutter cleaning Rosemont we find that business tends to pick up during the fall season. This happens due to the excess of leaves that almost all rooftops in Rosemont become littered with. These leaves than end up inevitably clogging your gutter system. This allows water to take the path of least resistance. Which can be anywhere. We have seen water pouring in through interior walls causing extensive damage. This is why we recommend that you have your rain gutters cleaned in Rosemont at least once every couple of years. Even the tiny pieces of gravel from your roof can cause your gutter system to clog over years. If you do not perform regular gutter cleaning Rosemont and maintenance then you will find that you will have much larger problems later on. If you do not perform this regular maintenance you will be putting your home at risk later on down the line. With our rain gutter cleaning Rosemont, you will be sure to prevent these potentially expensive damages from ever happening. Call today to schedule a rain gutter cleaning Rosemont and we will perform a routine maintenance to make sure that your gutter system is operating at its peak performance. Due to the weather in Rosemont we always have an extra crew standing by for emergency gutter cleaning Rosemont. We here at Monsters Gutters Cleaning Rosemont, take pride in the quality of work that we provide. Our gutter cleaning services take the worry and stress off your hands and will leave you with rain gutters that will last for years to come. Otherwise, when it rains water will flow over the sides of the gutter or through the bottom. Oftentimes, deteriorating the fascia boards & rafter tails. Many of our clients find themselves with a huge bill dealing with dry-rot. Our customers realize this danger and call Rosemont's best gutter cleaning service... Rosemont Monsters Gutter Cleaning (916) 333-0329 You Should call us today. When it comes to getting a gutter cleaned or all of your gutter cleaning Rosemont California residents find the most important aspect to be the service provider. Many gutter cleaners have left our clients downspouts clogged or not completely cleaned forcing them to find another service provider after the next rain. Gutter cleaning Rosemont has provided us a broad view of our competition which reminds us of the need to maintain our high standards. A home with a 1,600 square foot roof can shed about 1,000 gallons of water for every 1 inch of rain. A 21-foot gutter can weigh up to 300 pounds when completely full of water. Large rains and clogged gutters can be a big problem for any homeowner. This will cause your gutter to fail over time resulting in costly gutter repairs in Rosemont! Our Rosemont Gutter Cleaning is number one call today for a quote to be emailed right away. Rain Gutter Cleaning Rosemont is all exterior work. So there is no need for us to come to your home. This means that we can perform the rain gutter cleaning Rosemont at any time. Rain Gutters are an important part of your business or home and your main line of defense against water intrusion. They help to keep your biggest investment safe from flooding, they keep stagnant water from building up around your foundation. Avoid these costly water damages by having a routine rain gutter cleaning for your house in Rosemont. We provide a complete gutter cleaning service from the gutters to the downspouts including hauling away debris in Rosemont, California. Clean rain gutters are an essential part of making sure your gutters are functioning properly and doing their job the way they're supposed to.